It is strikingly pure and looks fantastic in any bedroom. 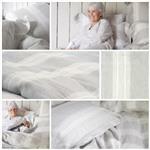 A pure linen sateen weave in on off white with subtle grey stripe pattern. Available in duvet covers, shams and pillow cases. Great with the SISCO bedding collection, SAG HARBOR and the SANTIAGO in the Oyster and Light grey colors. Select Bedding Size euro - 25"x25" Standard (SH) - 20"x30" King (SH) - 21"x37" King PC 21" x 41" standard PC 21" x 33" Duvet KING 106" x 92" Duvet QUEEN 88" x 92" Duvet TWIN 70" x 86"
100% Belgian linen in sateen weave. Pillow cases in Standard and King.